We are pleased to be able to share details with you of the April upgrade to EROAD’s Depot web service. The upgrade will take place at 7pm tonight (Monday 7 April). Our new feature allows you to add a reason for when an off-road geofence area overlaps public roads. 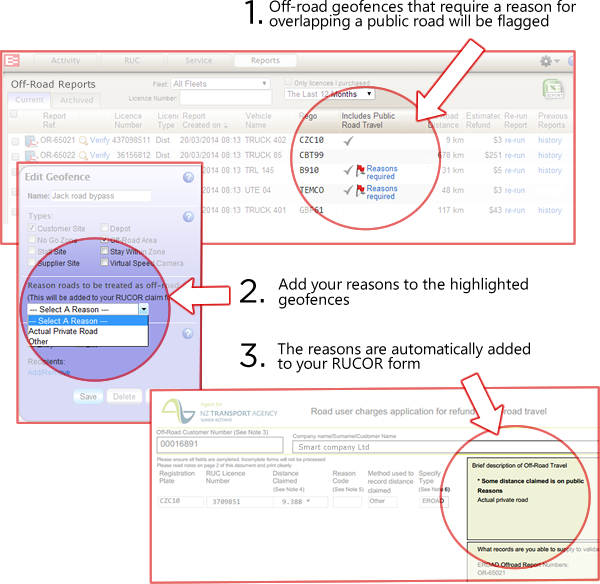 If an off-road geofence requires an explanation, it will be flagged in the Off-Road Reports screen. You can add a reason to this geofence by clicking on the red flag, which will take you to a verification screen to edit the geofence. You may notice the RUCOR form looks a bit different. This is because we're supporting NZTA’s latest form format. For further details, please see our Help site. Click or drag these icons to adjust the map screen to the size you wish to view it at. We will remember your settings for the next time you log in. If you want to reset the screen layout, there is an option to do this in the system menu. If you have had an Ehubo installed, but not yet assigned it to a vehicle in Depot, the Ehubo's travel events will be stored for you. Once you have assigned the Ehubo to a vehicle, travel events from installation or the last seven days will be visible. EZmessage will still automatically update to display new messages; our 'pull to refresh' is an added feature.